It's time for a new laptop and I spent some time doing research on the weekend. I had intended to wait for some good Christmas sales, but I got all excited when I was doing the research. I couldn't wait. I placed my order on Monday morning and received it yesterday by courier. It's so nice and new. It's a Thinkpad. 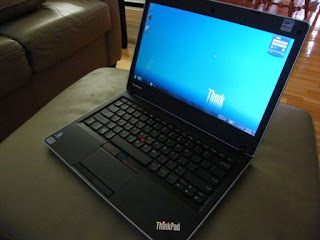 I compared similar models from the local stores, and for the same money, I chose my favorite brand of laptop, again. It's got much larger hard drive and 3 years warranty which I like. So while I should be starting to work on the borders for my nines and vines quilt, I'm distracted. I forgot all the little things you need when setting up a new computer. Looking for printer drivers, re-installing sewing machine and quilting software, setting up Itunes, etc, installing anti-virus, doing a backup, making recovery disks etc. It's amazing how the time passes when you're tinkering with all the utilities. I'll get back to the sewing on the weekend. While testing out (playing with) the Brother NX2000 machine, I'm getting lots of work done. 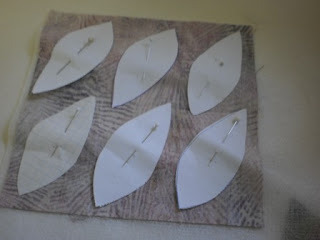 I've been picking away at making the nine patches for the nines and vines. I started just over a week ago, so I'm pleased with my progress. 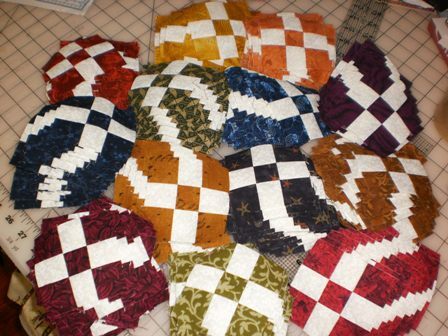 These 9-patches still have to be put into larger nine patch blocks, but before doing that, for a change of scenery, I'm starting to work on the applique and the borders. 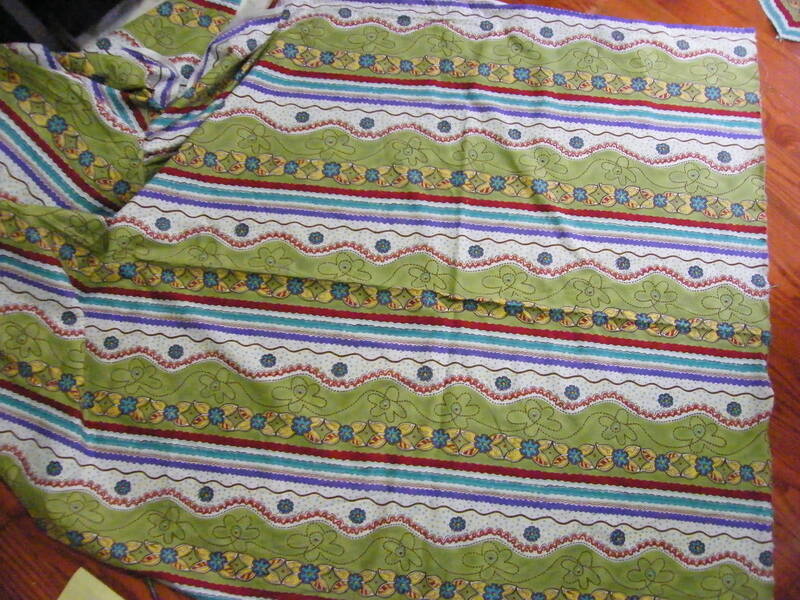 I'm really into making this quilt, and while I'm sewing away, I keep thinking that I should try some of the neat features on this Brother. 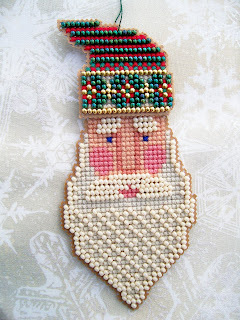 For example, I've been thinking about trying to make some new stitches, but I can't think of any, can you? I really like the vines with the stars and leaves applique on this Nines and Vines quilt. 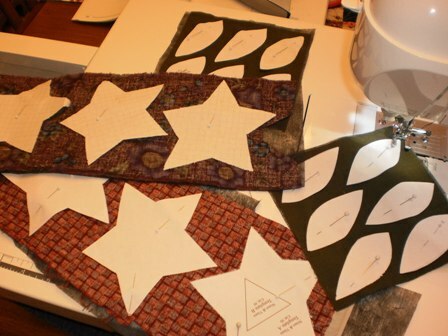 So it was refreshing to get out the light interfacing and use scraps of fabric for the leaves and stars. There's not that many stars, about 30, so I'm using small variety of fabrics. 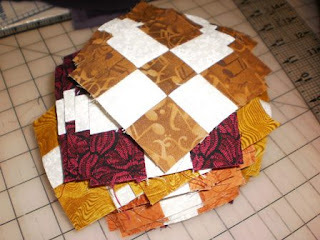 I loved that I saved my the paper shapes from making this quilt two years ago. It saved me some time. 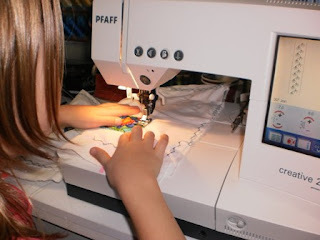 Do you applique this way? 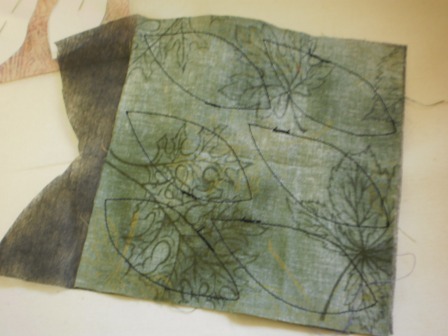 I use very light interfacing, and put my fabric right side down on the interfacing. I arrange my cut out paper pieces, and then simply pin them on the wrong side of the fabric (the interfacing is under) leaving a bit of room to trim around each shape. 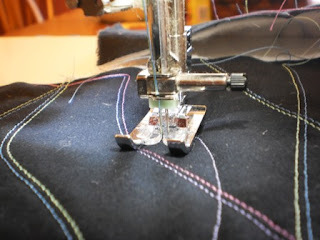 Using the open toe foot, I stitch around the shape. 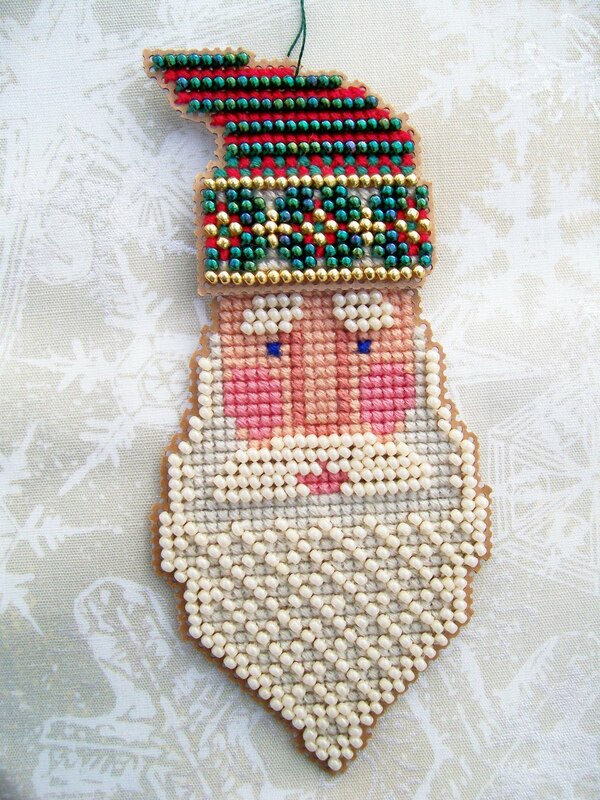 After stitching all around the shape, I pull the papers away (I save and reuse). These shapes are ready to be trimmed between 1/8th and 1/4 inch away from the stitching. After trimming, make a little slit in the middle of the interfacing on the backside and turn them right side out using a straw and BBQ skewer. When I get that far (probably tomorrow), I'll take a picture of the using the straw method to turn these. It's a neat trick. We had lots of visitors this weekend. Aurora and her Mom visited. Caitlin came to stay Saturday night so that she could help me entertain Aurora. 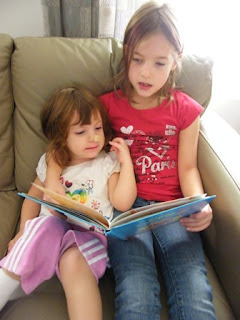 Here is Caitlin reading a book to Aurora. It was a story about patience. But not her mother who is named Patience, it was a story about growing a garden. Aurora loved sitting quietly while being read to. And a surprise visit from my sister and husband on Sunday morning. They were travelling back from Ottawa. Because it was going to be just a short visit before heading to Nova Scotia, we made a nice breakfast that featured Montreal style bagels, fresh fruit and quiche. On the Brother NX2000 I'm making great headway on sewing the strips for the nine patches in my Nines and Vines. I have finished about two thirds of the 235 nine patches that I require. I'm liking many of the features of the Brother. It tells me when my bobbin is low. I also winds a lovely bobbin... smooth and even. 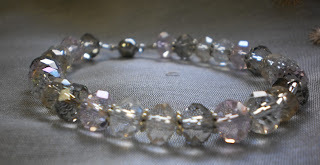 But today, I needed a break from sewing strips, sub cutting, and making the 9-patches. I decided to have a little fun with the Brother and make a small project. I was going through all the accessories, and discovered that a twin needle comes with this Brother. I haven't used a twin needle in years. It put a smile on my face and I had t try it out. I stitched a little sample swatch and decided I had to make something because it was so nice. After rummaging through my stash for just the right colors, I decided to make a Lazy Girl Take along bag. Are you surprised? It's like a comfort project to me. It's one of favorite small projects. (See my previous take along bags here, here and here and here) For this bag, I decided to use plain black fabric and use lines of twin needle stitching to embellish the black. I picked thread colors that were in the accent fabric that would frame the zipper. I started stitching waves of twin stitching. I used twin needle and embellished just the top layer and the batting. Then when it was time to add the backing and turn the sides of the bag right side out, I used single lines of wavy stitching to hold the three layers together. I omitted the pockets so this bag was done in a flash... well, ok... a couple of hours. Ta Da... finished, buttons and all. Sew here it is. 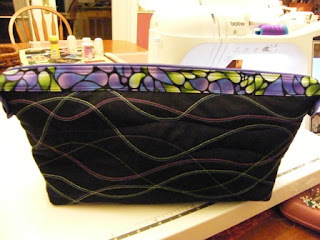 This WAVE inspired take along bag will be for a friend who invited us for an oriental dinner party next month. She'll be going on a cruise with her husband after Christmas and I think this will be a perfect hostess gift for her to take on her ocean voyage, don't you? Now that I've had a bit of a break, tomorrow I continue with my Nines and Vines. There's no school at elementary school on Wednesday afternoons. So, guess who I had for company this afternoon. Yep, we picked up the triplets from school just before noon and they came for lunch and they visited for the afternoon. We had a full afternoon planned. After turkey soup and home made rolls for lunch, popcorn and a movie was the perfect way to wind down after a busy morning. After the movie, each of the kids did a craft/activity of their choice. 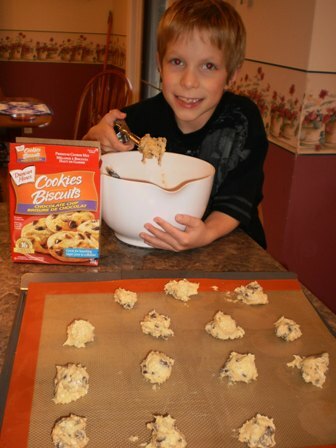 The recipe said it would make 16 cookies. 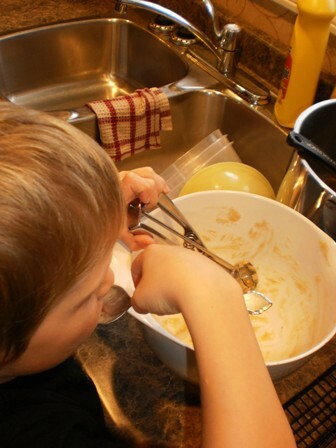 Well, there was dough for about 20 cookies, so, yep, lots of left over dough to eat, and then of course licking the scoop and the bowl clean. 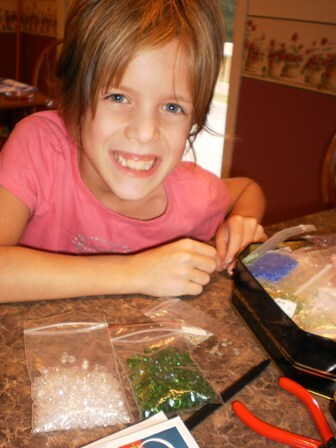 Grace chose to make jewelery. She's a real fashionista. 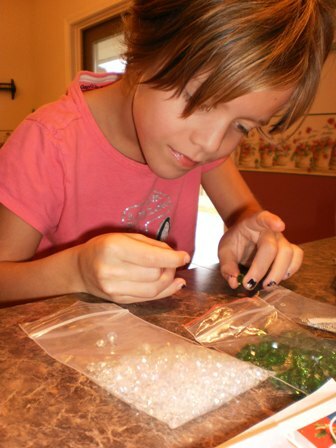 Here you can see she's stringing beads to make a bracelet for herself. She chose green and clear crystals with spacers in between. It's beautiful. Caitlin is a mini-me quilter. She sews almost every time she comes over now. 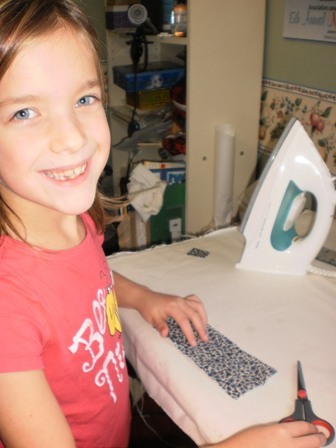 She doesn't need any help any more using the iron or using fabric scissors or using the sewing machine. She just disappears and if I don't see her right around, she's likely to be busy in my sewing room. Today, she had fun trying out different stitches. I asked if she wanted to try some fancy stitches on the new Brother machine that is sitting in my dining room, but she was more comfortable using my old faithful Pfaff. We had a fun afternoon. The other day I posted about getting my Special Delivery of a new high end Brother sewing machine. I should have given a better explanation as to why I have this machine for only two weeks. Through my blog, I was contacted by a representative of Brother Canada to if I'd like to try out their new Brother NX-2000 model. I love opportunities like this so I was quick to reply back confirming my participation in the evaluation. No strings attached. I knew it would be a few weeks before getting it, so in the meantime I decided to cut a Nines and Vines quilt kit to have ready. I decided early on that much of my evaluation would be while sewing this kit. I'm working away and have a few hours in on the nines and vines. But, since there's a ton of straight stitching in the Nines and Vines, I've decided to do a few other small projects too so that I can try out some of the other neat features. IE: design your own stitch... etc. 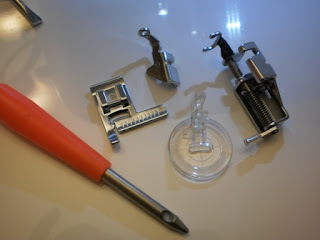 Here in this photo you can see only a few of the many many presser feet that come with this machine. I love that it comes with three free motion feet. I tried the open toe foot and I love it. I will try the others later this week. There's even a couple of odd items that I will definitely have to read the book for. One of the presser feet, I call it a sharkhead is a complete mystery to me although I can think of a couple of good uses for it. And the weird skrew driver tool that has a hole in it. Any guesses as to what that could be used for? I'll dig out the manual and let you know tomorrow. I've just received a special delivery.. 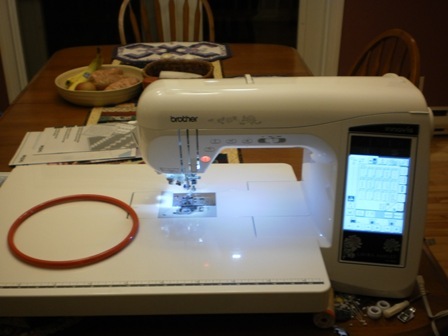 It's a brand new Brother NX-2000 Laura Ashley Sewing Machine. It's only mine for a couple of weeks while I use it and test it out. I was looking over all the specialty feet (I'm sure there were a dozen) and absolutely fell in love with the free motion foot. I think because it's an open foot and I can see where I'm going. So I decided I had to try it right away. I got out my halo and I free motioned for about an hour. I worked on the table runner that I made earlier this week. 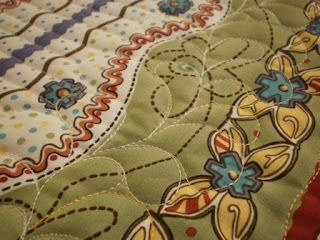 It was great to practice my feathers once again since I hadn't done any machine quilting since the spring. Anyway the bottom line is that this machine is great for free motion quilting, and I love that foot. Can you see my feathers? They're wonky but the stitches are very nice, both front and back. You can see the quilting better from the back in the next photo. Sew, so far so good. 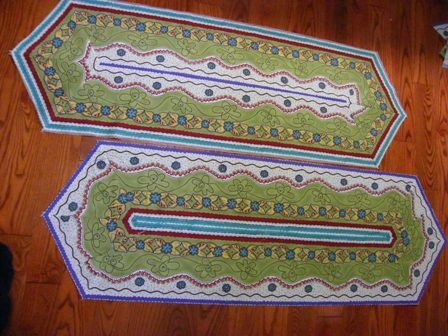 Now that my practice is done, next on my list is to test out the quarter inch foot and get to work on making a full size quilt with this Brother NX-2000. My kit is cut and I'm raring to go... but more about it next week once I've made some headway. While I was away on vacation, one of the Friday girls became a grandmother for the first time. That makes two of us grandmothers now in the Friday Girl group. 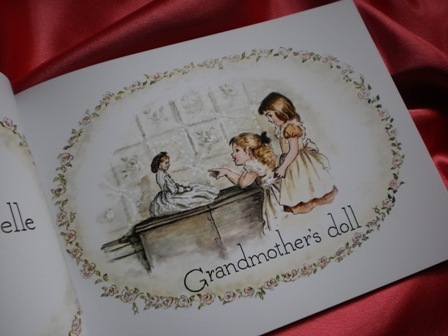 Her little granddaughter's name is Annabelle and when she's old enough to talk, she'll call her grandmother "Gran". My grandkids call me Grammie. 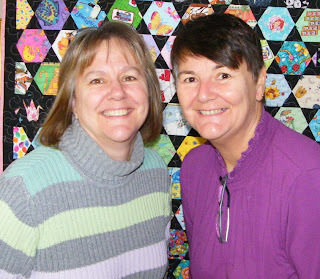 A little while back, when I was collecting fabrics for my I spy quilt for Aurora, my friend found me a fabulous "A" that I was so glad to get. Now we both will be collecting all things "A". As a special gift, from one Grandmother to another, I bought this darling little book to give to my friend. 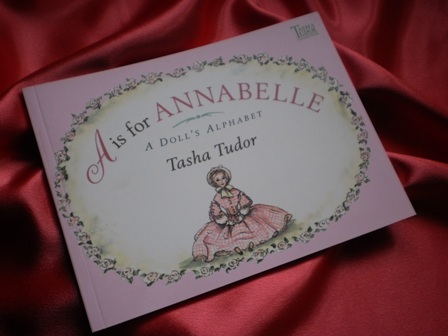 I can just imagine when Annabelle is a little older, she'll really enjoy reading this little "A is for Annabelle"ABC book with her Gran. I ironed my 1 meter of striped fabric. This fabric had 5 repeats of the same striped pattern. I folded my striped fabric, so that all the stripes were lined up perfectly (not selvage to selvage in this case). Using my rotary cutter, I found where the repeat started, and cut 5 strips. Using one of the strips, I unfolded it and laid it out on my cutting table. I lined up the 60 degree mark on my ruler and went on to cut 8 triangles. 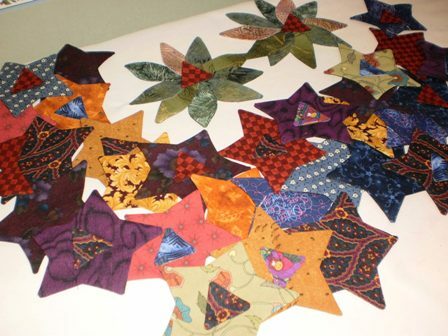 Because I was cutting from both sides of the strip, I had 2 sets of 4 triangles... each set different from the other. I then took two of the other 4 strips and laid them on my ironing board, positioning them so that they were a mirror image of each other. With right sides together, I placed the matching triangles on the ends of the strips. I made sure that both strips were matching. 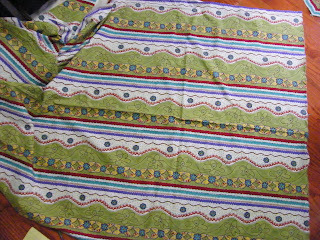 After sewing the outside seem on the triangle, I pressed and trimmed away the excess. The triangles need to be pressed outwards. 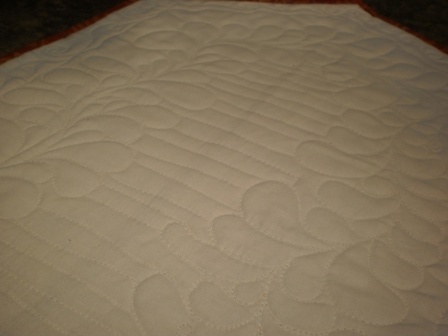 Then simply match up the two long halves of the runner and pin and and sew that long center seam. That's it - 5 seams. 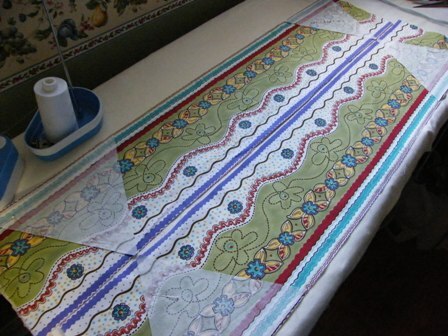 Then repeat with the other 2 strips, and 4 triangles, and voila, you have 2 table runners to practice your machine quilting on. Post Note: I just realized that on the Jinny Beyer website, she has a placemat using this same technique. It would be easy to make the runner using the same templates. 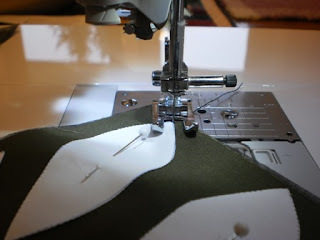 Sew Easy!! Check it out here. It's hard to believe, another Halloween has come and gone. 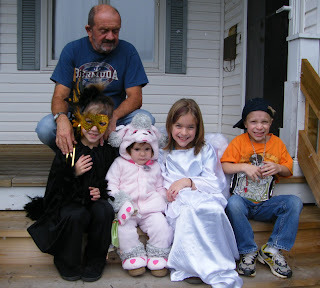 Here you can see our first set of trick or treaters yesterday. Look familiar?...A Blackbird, a Poodle, an Angel, and a Wrestler. With Grampie looking on, they're about to go visit my next door neighbor. Do you suppose she'll guess who they are?